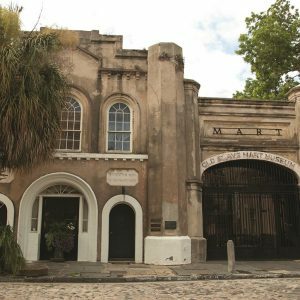 The Old Slave Mart is the only known extant building used as a slave auction gallery in South Carolina. Once part of a complex, the Slave Mart building is the only structure to remain. When first constructed in 1859, the open ended building was referred to as a shed, and used the walls of the German Fire Hall to its west to support the roof timbers. Slave auctions were held inside. The interior was one large room with a 20-foot ceiling, while the front facade was more impressive with its high arch, octagonal pillars and a large iron gate.